I love how they play together! B always looks forward to hanging out with Mara and Wes. How cute are his little glasses And the “wild one” shirt perfectly describes him lol. OBSESSED with all her little pom pom socks and the size variation with the sweatshirt. I can’t believe summer break has come to an end! It’s bittersweet because I love having the kids home from school and getting to spend so much time together, but the excitement of back to school shopping softens the string a little. I always looked forward to back to school shopping when I was a kid and it’s been just as much fun as a parent now! Here are 4 back-to-school style pieces that every kid needs for the year ahead. Something fun! You will never regret investing in a statement piece that your kids get excited to wear. Sure they might try to wear it 3 days in a row, but there are worse things, right? Mara loved this pom-pom sweatshirt and tulle skirt. It’s a fun outfit to throw into their school clothes rotation and every kid needs an outfit they feel extra special in and I love this one! It’s so fun to see the kids’ personality and style develop as they get older every year. Staples they can mix and match. This is one of the biggest lessons I’ve learned in buying kids clothes. The more versatile and mixable the pieces you buy, the more use you’ll get out of them. Think solids, layers, and classic patterns like stripes or camo. Gymboree’s latest campaign has lots of options to mix and match so just a few new pieces can go a long way and create multiple outfits. Graphics. There’s a happy middle ground between busy prints and basic solids and it’s call graphics! They are a great way to let the kids’ personality show through and can help break up the patterned and solid pieces they own. I love the fun patches on this graphic pullover and it’s also pretty accurate. Everything comfortable. If it’s not comfy, my kids won’t wear it. (Actually, I’m the same way with my clothes haha!) So the biggest things to look for are comfort and quality – pieces that can handle whatever kids throw at them. That’s especially true of denim, which probably gets the brunt of a fun day. Love the jeans we found for Wes and B which are really soft and still durable. Gymboree is dialing up the comfort and softness of their line, so it’s a great destination for quality pieces. What are some of the things you guys look for when back to school shopping? Do you love it as much as I do? If you haven’t checked out Gymboree’s Made-You-Smile campaign this season, let me know what you think! The post 4 Back-To-School Pieces Every Kid Needs appeared first on Hello Fashion. Pinky and peachy tones – my dress just went on sale under $25! Wes loves sharks and we found a bunchÂ of shark graphic teesÂ (on sale) – such a good find if you have any kids who have a thing for shark! Happy Friday guys! Who else is excited for the weekend?? 1. No matter how old the kids get they still light up every time we play with bubbles! 2. I can’t handle how cute Mara is carrying around her purse! She even carries around my credit card and keys in her bag when I don’t feel like bringing mine. Haha! 3. Wes is losing all his teeth at the same time! It’s so cute and we can’t help but laugh because every time her smiles there’s almost a full open gap where he’s missing 4 teeth. The two front teeth are slowly starting to grow in so it won’t last much longer but I’m loving all the pictures we are getting in the mean time. 4. I’ve mentioned it before, but the kids would pretty much live in athletic clothes if they could get away with it. Sometimes they need something a little more dressed up. I found these shortsÂ and this styleÂ from the Jumping Beans line at Kohl’s that look nice but are still really stretchy and they don’t restrict the kids at all. Best of all, they are under $10 so it’s a great budget find and I don’t worry if they are a little rough on them while they are playing. 5.Â Converse are one of the first shoes I ever bought for Beckam when he was a baby so I’ll forever have a soft spot for them. IÂ love that they make them in everyone’s size in the family because I’m obsessed with matching sneakers. 6. I can’t believe the school year is almost over! The kids only have 2 weeks until they are out of school. This year is flying by!! 7. I always look forward to the summer because we have more time with the kids. 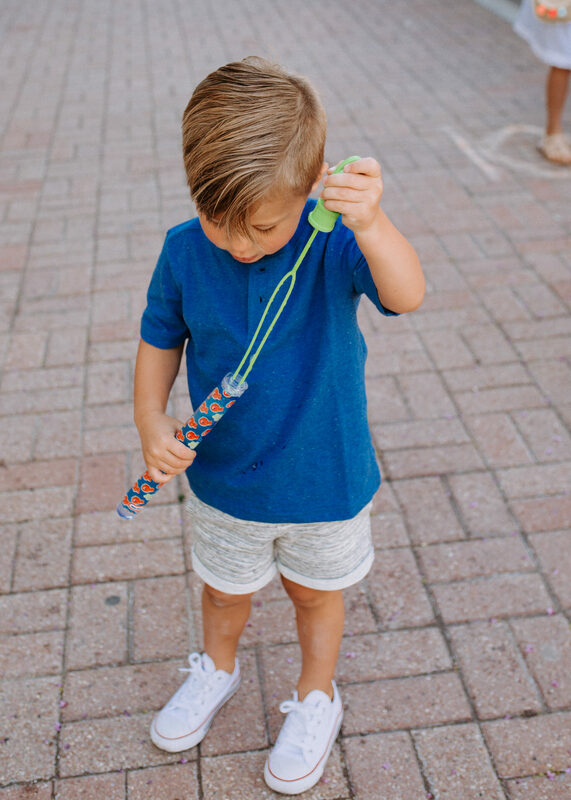 It seems like during the school year they are in sports and dance so much during the week, so it’s nice to have that extra time to really play with them, go on hikes, visit the splash pad, or go on a summer getaway. *In collaboration with Kohl’sÂ and Popsugar. The post Bubbles and 7 Things appeared first on Hello Fashion. Cody and I grew up playing sports and the kids are all in sports, so we’ve always been a really active family. Â Cody and IÂ do different workouts at home when we don’t make it to the gym and Beckam has started trying to imitate some of the exercises. He’s mostly picked up on lunges and push-ups and always says,”Look at my push-ups like dad!” or “Look at my legs, mom!” It’s seriously the funniest thing! Nike and Adidas have become our family’s favorites. Â For the kids, it starts with Wes – all he wants to wear is his baggy athletic shorts and tees. Beckam, in true little brother form, just wants to copy everything that Wes wears. Mara is so cute and wants to coordinate with B so it comes full circle and everybody usually ends up in some kind of sportswear look. How cute is she?!! Obsessed with her pastel outfitÂ (ON SALE)! B never wants to take his cleats off! When he opened them he was so excited and put them on immediately and started running up and down the stairs showing off how fast he was in them. It’s like in his head he is playing the part of a soccer player but once he got on the field at his last game he refused to play but he still considers himself a full time soccer player off the field, haha. We also got him this outfit and this oneÂ and I melt every time he wears them! So cute! I love the bright and colorful kids selection they have at Kohl’s, especially their pastelsÂ (also got these for Mara in mint). They have so many cute athletic pieces for the kids and you can always find a good sale or deal! Athletic pieces always hold up well so I don’t have to worry about the kids being rough on clothes. Love love this shirt on B. The bright lettering really pops – it’s one of his favorited shirts. I gotÂ these black shorts and loved them so much I ordered them in olive and pink, too. A lot of my Nike shorts flare out on the side, so I love that this pair doesn’t. I also ordered these white sneakersÂ while they were running a 15% off sale. Honestly it was one of those pieces that you buy because they are on sale even though you don’t know if you really need them, but in person they are SOOOO CUTE. They make any workout look really pop with the crisp white. I’m obsessed – they’ve been on repeat!! Obsessed with this pink tankÂ (ON SALE!) under $50. Below more great sportswear finds at Kohl’s! The post Family Sportswear Styles on Sale appeared first on Hello Fashion. Obsessed with these bracelets. I wear them almost everyday! Mother’s Day comes with a lot of meaning in our home – it’s actually always had a lot of meaning to me personally. As a child in a blended family, I had the joy of having two amazing women play mom roles in my life and now I’m experiencing it from the other side within our own little blended family. It’s funny – before I had kids, I always thought being a mom would be one of the easiest things. (I guess that’s a tribute to my own mom and step-mom for makingÂ it look so easy but it’s taught me some of my hardest life lessons and also brought me some of the greatest joy that I didn’t even know was possible to experience. I’m so grateful for 3 kids that mean so much to me. And even though for two of them I’m only their stepmom, I hope they know what an impact they’ve had on my life and how special they are to me. It always surprises me how each kid has such a different personality. They have to be parented so differently, they have different love languages, and they are all just so unique in their own way. As moms we continually feel like it’s our job to teach our kids, but today I wanted to share a few things that they have taught me. Got Mara and myself these little lockets that each hold a picture of our family. They are so special and I hope she keeps it to give to her daughter one day. Also got one for my Moms as a gift from the kids for Mother’s Day. The oldest child and the biggest nurturer. I didn’t have siblings growing up, but I can’t imagine a better sister. Mara is super loyal, artistic, and giving. Super shy unless you know her well.Â She loves to take care of her brothers and play Mom. She’s taught me patience. Honestly she’s more patient than me a lot of times, especially with Beckam. No matter what he asks or wants she is there to make sure he is okay. Mara’s laugh is so contagiousÂ and she will make such an amazing mom one day!! Wes is always mistaken as the oldest. He values quality time and doing things to together. He is the sensitive one in the family, but not in a whiny way, he just senses people’s feelings and hates conflict. He always knows if someone is upset and will be the first to give you a hug or try to include you if you’re feeling down. Whenever the siblings fight he is the first to apologize and say sorry. He’s taught me to let things go easier when Cody and I are in a stupid fight and I love what a cuddler he is! He has such a big heart! Partially it is the age, but the way he looks at life is so beautiful. Everything is the most exciting thing in the world to him, rolling down a hill of grass, blowing bubbles, seeing a cool bird in the sky, everything is an adventure. HeÂ is also the trouble maker in the family. Full of mischief but the life of the party.Â His excitement about life makes my day. He’s taught me to appreciate the little things, and to love in a way I didn’t know possible. I know on Mother’s Day we are always thinking about our moms and, if we have kids of our own, celebrating having them in our life! I wanted to take a moment to celebrate the 3 people who have given me the best gift of being a mom and say thank you to my own moms who have given me such a good example of what that means. The post Lessons I’ve Learned From Being A Mom appeared first on Hello Fashion. Pastels! You can never go wrong with monochromatic pastel tones for Easter. I’m obsessed with these drawstring shortsÂ (under $100). They are the prettiest color and they pair perfectly with this ‘Some Bunny Loves You’ tee. One of the joys of being a mom is being able to have someone to twin with (at least until they are old enough to protest ;). I love these matching bunny face pieces (this kids comes in both grey and pinkÂ – also love this one And is there any outfit more comfortable than a light sweatshirt and distressed boyfriend jeans?Â It’s perfect for hanging out at home or just running errands. All orders placed by tomorrow for our Easter collection at ILY are being sent priority mail so you have before Easter So hurry and order today! The post 4 Casual Outfits To Wear Before Easter Sunday appeared first on Hello Fashion.